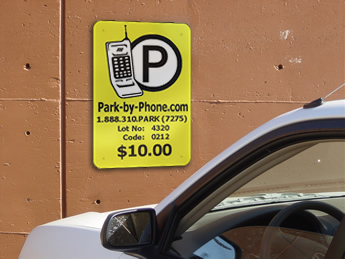 Park-by-Phone is a convenient and unique service program which allows Park-by-Phone members to phone in their parking fees by cell phone and a unique location code. The cost of the program is $5.95 per year. You will be billed monthly for all phoned-in parking fees plus a 10% convenience fee. 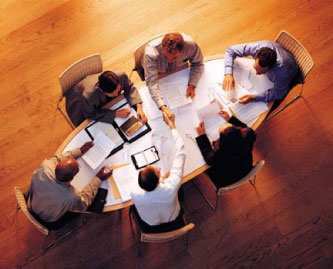 The annual membership is automatically renewed on the anniversary date of your registration. In order to cancel any ongoing renewal fees, once your account is paid in full for all parking fees, you must send an email to customerservice@park-by-phone.com for notification of cancellation. Please provide your name, member number and notification of cancellation. An annual member fee of $5.95 will be charged at the time of registration. After the user has entered in the registration information and submitted the form the member will print the temporary membership dashboard card (Fig. #1) and a member number. The member will be assigned PIN number (initially the last four digits of the credit card used at sign-up). 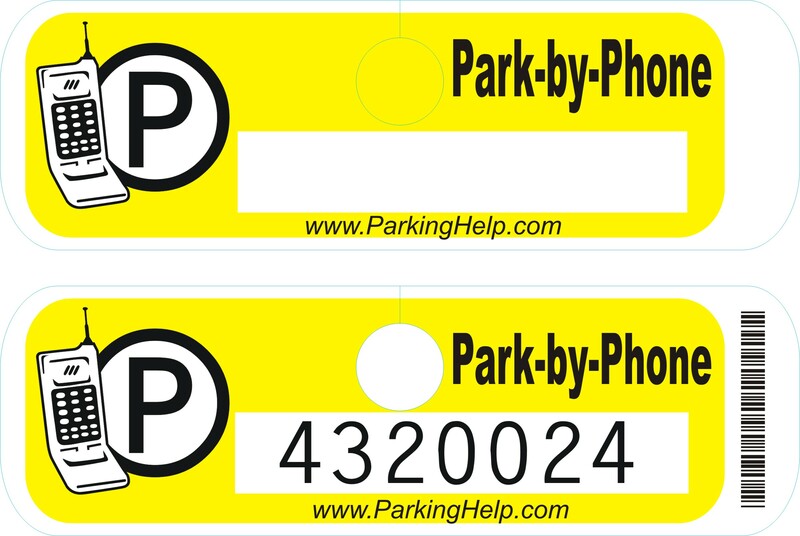 This 4-digit PIN number is used when parking at a Park-By-Phone.com enabled meter or lot if the member id phone number is not recognized. 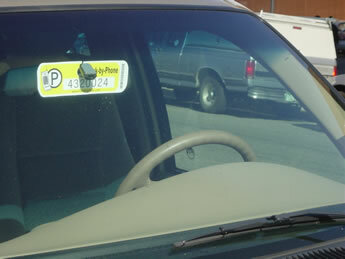 Place the Park-By-Phone.com card on the car's dashboard (Fig. #4) or hang the card from the rearview mirror (Fig. #5). The Park-By-Phone.com automated attendant prompts the member for their member number from their dashboard card. If the member number is recognized then the Park-By-Phone.com automated attendant prompts the user for the lot or meter number. 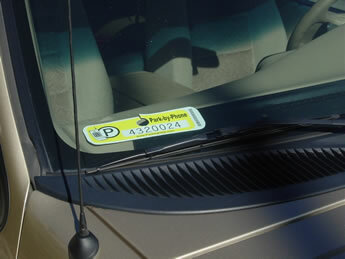 Member may "repeat last transaction" for meter feeding or if parked in the same location when Park-by-Phone was last used. If the lot or meter number is recognized then the Park-By-Phone.com automated attendant returns the parking duration and fee. The Park-By-Phone.com automated teller then prompts the user for the 4-digit PIN number that was sent to the member via e-mail. If the 4-digit PIN number is entered correctly the members account is updated. Members are billed automatically at the end of the month for all parking activity plus a 10% convenience fee. 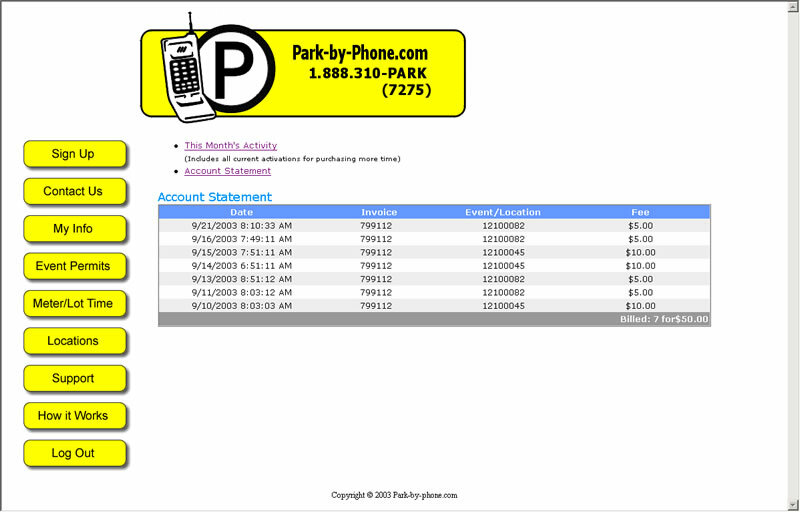 Member can log-on to Park-By-Phone.com at anytime and view their monthly statements. Members can "Feed the Meter"
You are in a meeting and you know your meter/lot space is about to expire and you want to avoid a ticket. 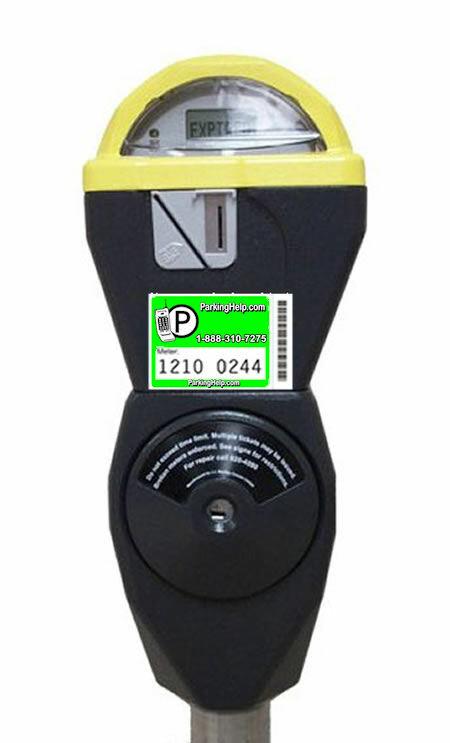 All you need to do to solve your problem is call Park-By-Phone.com, or go online to www.park-by-phone.com and buy more time for your meter or lot space. This report shows the date, invoice, event/location, and fee for all transactions of the current month. This report shows the date, invoice, event/location, and fee for any previous months transactions. 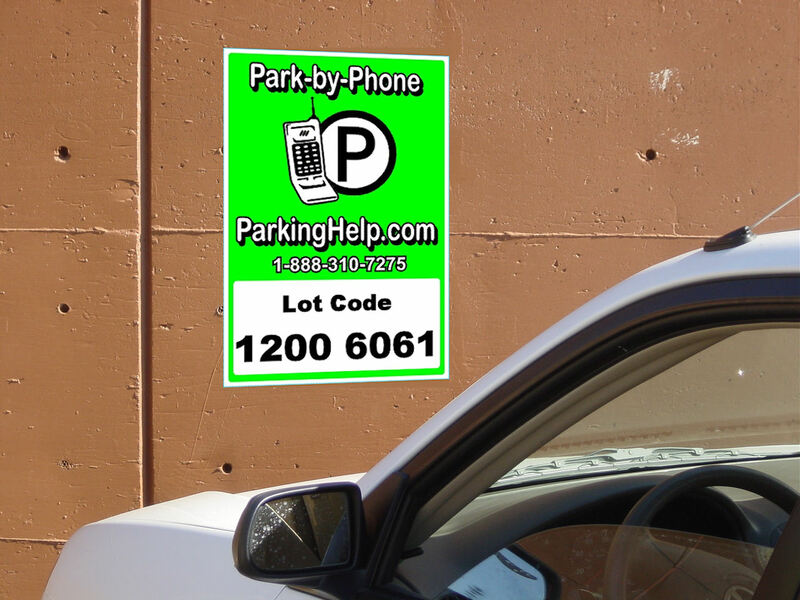 Online parking, meter time, daily or longterm lot space, with a simple phone call.